Through objects from the museum's National Numismatic Collection, this exhibition explores the development and meaning behind American coinage and currency and demonstrates the interplay among people, money, and history from the earliest times to the present. America's Money shows what money looked like in colonial America and at pivotal times in the nation's history, including the gold rush, the Great Depression, and the current era. It also compares coins from the 19th century with those produced during the renaissance of American coinage in the early 20th century. The Power of Liberty features an array of coins from the U.S. and around the world depicting Liberty, the feminine personification of freedom, as well as coins featuring real and mythological women. Women on Money shines light on the vital contributions of women to national and world history. Historic women have appeared on money for more than two millennia. Governments use coins and notes to commemorate women’s achievements in politics, social movements, and the arts and sciences, as well as to convey national ideas and ideals. 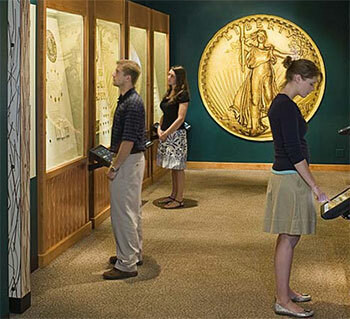 Interactive stations allow visitors to view enlarged images and learn more about numismatic history.